What makes strolling down a particular street enjoyable? The authors of Measuring Urban Design argue it's not an idle question. Inviting streets are the centerpiece of thriving, sustainable communities, but it can be difficult to pinpoint the precise design elements that make an area appealing. This accessible guide removes the mystery, providing clear methods to measure urban design. In recent years, many "walking audit instruments" have been developed to measure qualities like building height, block length, and sidewalk width. But while easily quantifiable, these physical features do not fully capture the experience of walking down a street. In contrast, this book addresses broad perceptions of street environments. It provides operational definitions and measurement protocols of five intangible qualities of urban design, specifically imageability, visual enclosure, human scale, transparency, and complexity. The result is a reliable field survey instrument grounded in constructs from architecture, urban design, and planning. Readers will also find a case study applying the instrument to 588 streets in New York City, which shows that it can be used effectively to measure the built environment's impact on social, psychological, and physical well-being. Finally, readers will find illustrated, step-by-step instructions to use the instrument and a scoring sheet for easy calculation of urban design quality scores. For the first time, researchers, designers, planners, and lay people have an empirically tested tool to measure those elusive qualities that make us want to take a stroll. Urban policymakers and planners as well as students in urban policy, design, and environmental health will find the tools and methods in Measuring Urban Design especially useful. "They provide operational definitions and measurement protocols for five intangible qualities of urban design: imageability, visual enclosure, human scale, transparency, and complexity"
"This timely guide draws upon the best available research to show how contextually rich and robust metrics of urban design, like legibility and imageabilty, are associated with active, livable places. Designers, planners, public health professionals, and anyone else who cares about quality of urban living will gain a lot from this book." "Everyone has turned to a companion and observed, 'This is a great place, I am really glad to be here.' But few of us have the lexicon, and even fewer have the data, to support our assertion. Good for Ewing and colleagues for bringing both to us, and in such a clear and readable way." "Developed to assess the mixed-use streets that are key focal points in livable places, this guidebook clearly shows how to measure important urban design concepts. In detailing how they developed the checklist and what it is best at measuring, the authors make a substantial contribution to urban planning and design." 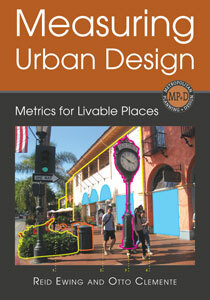 "Measuring Urban Design promises to open a new field of evidence-informed urban design. This book, which began as an Active Living Research grant, is a big achievement in creating metrics for urban design qualities. It should be used widely to create more liveable and health-promoting urban places." "This book will be valuable to those interested in the process—and particularly the pitfalls—of developing numerical measures of urban condition."